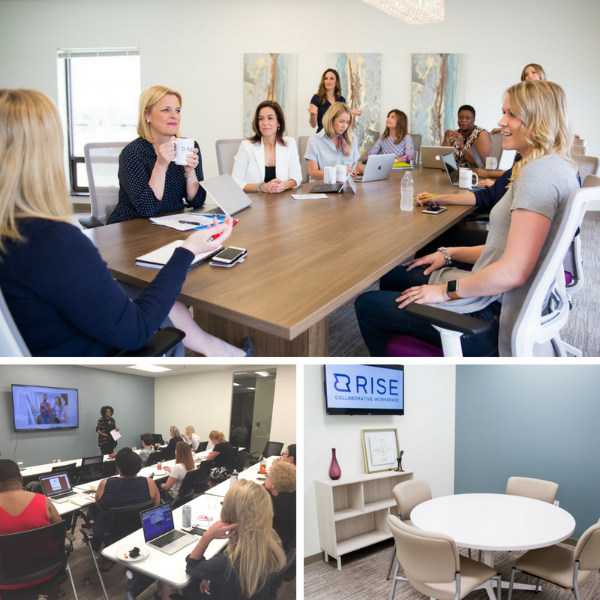 RISE Collaborative is excited to expand to Denver. We will be located near the Cherry Creek area with 10,000 square feet (great for hosting events) and 30 plus parking spots. The building has huge windows and a ton of natural light. Coming Soon! In St. Louis we sold out of our 11 private offices before the Grand Opening. Denver will have 14 private offices and will go quick. Our Founding Office Members really shape the community and are leaders in our space. We strive for industry exclusivity for the private offices and have created quite a diverse mix in St. Louis (Accountant, Event Planner, Digital Marketing, Executive Director, Counselor, etc). Each private office is furnished with a desk, adjustable office chair, and wastebasket. Private office members may bring in additional furniture and decor. For people who are not looking for a private office, but are seeking community and connections, a drop-in membership is perfect. We have multiple levels to fit your need. Social Members are people who have little to no need for a workspace, but want to attend our weekly social events focused on growing personally and professionally. They also enjoy being tapped into our community and enjoy member rates for room rentals. Full Time Members are looking for a home-base and enjoy unlimited access to the workspace. They are sick of working from local coffee shops and really enjoy being in a space where everyone knows your name. Dedicated Desks work great for people who want all the bells and whistles of a private office (mailing address, place to store your stuff, and 24/7 access), but want a more affordable option.